OXFORD, Miss. 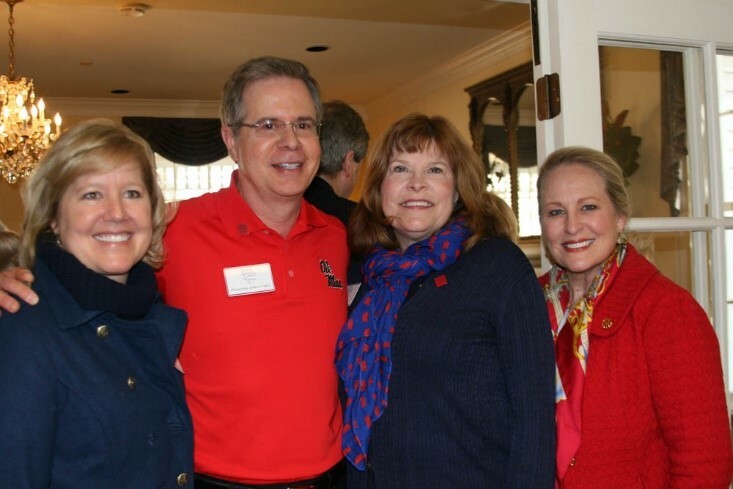 – This past weekend, Ole Miss Women’s Council for Philanthropy members, Rose Society members and Women’s Council scholars gathered at the Brandt Memory House to officially welcome Chancellor Jeffrey and first lady Sharon Vitter to the University of Mississippi. Decked out in Grove attire, members mingled over a brunch before heading to the Ole Miss men’s basketball game against Arkansas. Chancellor Vitter also addressed guests during the event and shared his excitement to be working at the university and with the Women’s Council. During the brunch, it was also officially announced that Sharon Vitter had accepted an invitation to become an honorary member of OMWC. “The Women’s Council offered Mrs. Vitter an honorary membership because she brings prestige and perspective to the council as the wife of the chancellor,” said Karen Moore, chair of OMWC. Lydia Jones and Margaret Khayat both joined the council as honorary members, and we are thrilled that Sharon would agree to continue this tradition. Sharon Vitter, a native of Kansas, graduated from the University of Kansas with a degree in pharmacy. After marrying Jeff Vitter, she took on a different role through her involvement in their children’s school parent programs, and as her husband served in various roles throughout his career such as provost and vice chancellor, she was able to take an active role in service and hosting various guests at the universities. Now that she is in Oxford, she is even more excited to get involved with campus life, especially programs that have interested her for years. While it has only been a short time since she has been in Oxford, Vitter said she already feels the welcoming atmosphere from the Women’s Council. “The women that I’ve met so far are an amazing group of women from all walks of life. I think it is great what they do with their scholarships and finding students that are deserving and show potential. I feel honored to be asked as the chancellor’s wife to be an honorary member, and I look forward to working with the students,” she said. One of the first OMWC events Vitter attended was its dinner series for scholars and mentors. Each month, the council hosts a Red Plate Supper series, where scholars and mentors gather with council members to have dinner featuring a guest speaker. The Rose Society, a key component of the Women’s Council, funds all the Red Plate Supper series, cultural trips, leadership development and a host of other programs and scholarships. “The Rose Society was begun as a vehicle to provide support for mentorship and leadership programs for the council scholars and, when possible, other students at Ole Miss as well,” said Mary Haskell, incoming chair of OMWC. To learn more about the Women’s Council and membership in the Rose Society, contact Nora Capwell at 662-915-2384 or ncapwell@olemiss.edu.